Peptide (C)RDPESSAMLDYELH, corresponding to amino acid residues 205 - 218 of mouse Plexin-A2 (Accession P70207). Extracellular, N-terminus. 1, 2. Anti-Plexin-A2 (extracellular) Antibody (#APR-082), (1:200). 3, 4. Anti-Plexin-A2 (extracellular) Antibody, preincubated with the control peptide antigen. Immunohistochemical staining of perfusion-fixed frozen rat brain sections using Anti-Plexin-A2 (extracellular) Antibody (#APR-082), (1:400) and mouse Mouse Anti-Rat p75 NGF Receptor (extracellular) Antibody (#AN-170), (1:300). A. Sections of rat horizontal diagonal band (HDB) were stained for Plexin-A2 (green). B. Same sections were stained for p75NTR (red). C. Merge of the two images reveals cells expressing both Plexin-A2 and p75NTR (horizontal arrows), cells expressing only Plexin-A2 (upwards pointing arrows) or cells expressing only p75NTR (downwards pointing arrows) can also be observed. Cell nuclei are stained with DAPI (blue). Tamagnone, L. et al. (1999) Cell. 99, 71. Janssen, B.J. et al. (2012) Nat. Struct. Mol. Biol. 19, 1293. Nogi, T. et al. (2010) Nature. 467, 1123. Tian, T.V. et al. (2014) Oncogene. 33, 2204. The Plexin gene family is comprised of at least 9 members in 4 subfamilies. 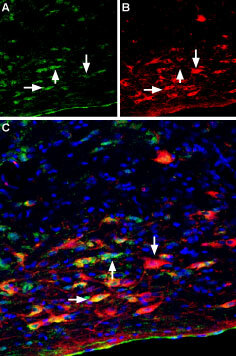 Plexins are widely expressed in neurons but have been also detected in epithelial cells1. Plexins closely interact with a large family of proteins called Semaphorins which control a variety of processes in the CNS including cell migration and axonal growth. Plexins and Semaphorins share a common feature of a conserved 500 amino acid “sema” domain2. The ectodomain of PLXNA2 is an N-terminal seven bladed β-propeller sema domain followed by a cysteine rich PSI (plexin-semaphorin-integrin) domain. PLXNA2 has four N-terminal domains and unlike semaphorins the sema domain of unliganded PLXNA2 does not homodimerize readily. Many of the functions of Class 3 semaphorins (Sema3A-Sema3G) are mediated by Plexin-A2 (PLXNA) and other A-plexins. Sema3 signaling depends on semaphorin interacting with one of the two Nrp co-receptors that associate with PLXNA to generate holoreceptors. PLXNA also interacts with semaphorin 6A (Sema6A). Before binding, the Sema6A ectodomain can be found in a ‘face-to-face’ homodimer arrangement, similar to the arrangement in Sema3, whereas PLXNA is in an unexpected ‘head-on’ homodimer arrangement. The structure of the Sema6A–PLXNA signaling complex is a 2:2 heterotetramer3. In prostate cancer TMPRSS:ERG gene fusion causes aberrant expression of the transcription factor ERG and the induction of cell migration and invasion. TMPRSS:ERG upregulates PLXNA expression and elevated PLXNA levels were found in prostate cancer cells. Levels of PLXNA were even higher in metastatic prostate cancer than in localized tumors suggesting PLXNA may play a role in the disease’s development. Alomone Labs is pleased to offer a highly specific antibody directed against an epitope of mouse Plexin-A2. Anti-Plexin-A2 (extracellular) Antibody (#APR-082) can be used in western blot and immunohistrochemistry applications. The antibody recognizes an extracellular epitope and is thus ideal for detecting Plexin-A2 in living cells. It has been designed to recognize Plexin-A2 from rat, mouse and human samples.